In the time between Jeremy Lin leading the Charlotte Hornets to a huge win over the Memphis Grizzlies and their come down game against the Boston Celtics, there’s time for Steve Clifford to think about how he wants this season to look. 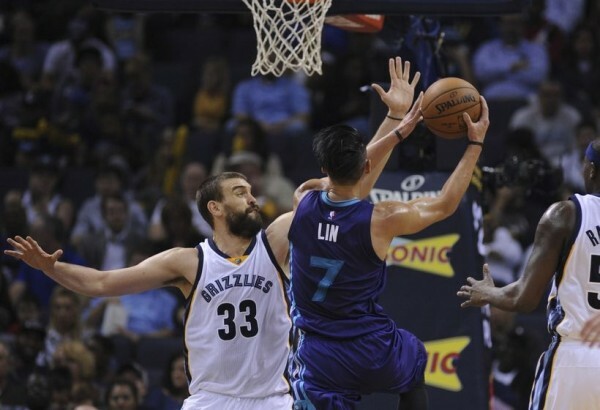 The Hornets beating the Grizzlies 123-99 didn’t happen just because Lin was good. Kemba Walker scored 33 points on 12-of-19 from the field with five 3-pointers; Nicolas Batum scored 20 points with five 3-pointers as well. From the moment the bench turned the tide and made the 11-0 run from the Grizzlies to open the game a forgotten memory, everyone was clicking and hitting shots from every direction and distance. But this wasn’t the first time the bench unit, Bench Force 1 as its called by some fans in Charlotte, saved the butts of the starters, who often pick things up very slowly and sluggishly. Lin finished with a +25, the best on the team during his 27 minutes on the floor, despite not even doing too well offensively during his finishing stretch, which is something that happened quite a lot to him recently: He starts off great when he needs to push the team out of something, but later in the game, maybe after sitting out for too long, his offense goes cold. It wasn’t something to worry about in the win against the Grizzlies, and if he keeps playing like he did during his first stretch on the floor which was about pushing the Hornets at a pace and rhythm we’ve seen too little of them this season but we’re know they’re capable of, Lin can afford doing less than great during garbage time minutes. His defense sticks through the entire game, which isn’t the first time we’ve mentioned is the most impressive part of his developing and evolving repertoire. Shots dropping or not is less of an issue when he literally causes a pandemic of the good kind of the team running the floor so much harder than it does when opening the game, and reaping the rewards for it. The Hornets ran away with the game when Lin wasn’t playing, with Walker and Batum finally playing the way it should have started for them. You can’t give Lin all the credit for them starting to play well, but you get the point. Without him pushing the second unit to the highs we’ve seen from them and especially in the win at Memphis, there might not have been the kind of comeback we saw. Lin was the only player capable of throwing the game off balance like he did, and he’ll remain that no matter who much Clifford ignores it on a long term basis. And heading into the encounter with the Celtics, once again, the focus is on continuity. The Celtics are coming deflated, traveling, with no day off. The Hornets are coming on a high, with no day off, traveling. This might lead to some changes in regular rotation, and maybe more mistakes on both sides. But Boston aren’t Memphis. They have a better coach, have much better guards and don’t mind running when compared with the Grizzlies. Lin isn’t going to start. The second team has no excuses for existence without him, even if the numbers don’t always tell that story (although 16 points with 3 blocks aren’t too shabby). But Clifford can’t start once again toying with the minutes of the most important player he has. Lin doesn’t make money like one of the “stars” on the Hornets and doesn’t play as much as they do, but his influence on the game, when there’s someone backing him up from the bench, even when he makes mistakes, is something no other player on this team has.